The universe and your writing both operate by projection. I’m sorry if I’m the first person who ever told you that. There’s always an awkward moment in my classes when we cover this material. 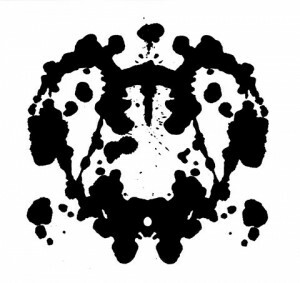 I’m not a psychologist, but it seems pretty clear that if thematic apperception tests, like the Rorschach Test, can demonstrate that everything we perceive comes from inside our selves—then it’s not that far to the conclusion that everything we create also comes from inside our selves. Projection: A defense mechanism in which intolerable feelings, impulses, thoughts and traits are ascribed to other people in order to deny that they are a part of one’s self… characterized by: externalization, turning of tables, inability to take responsibility for one’s own demons. (Oxford Dictionary of Psychology, 2003). You wouldn’t believe how much of the material in your fiction is formed in this way. I’ll stop short of saying all of it. We blindly send our subconscious into the world to meet and meddle with other parts of our subconscious, to settle scores and fulfill wishes, all the time unaware of the origins and ramifications of what we are doing. We don’t know our motivations, we don’t ask the right questions to gain mastery of our material, and so we struggle with revision because we fear that to become too aware of the process is somehow to break the spell (and probably to have to work on ourselves). It all seems pretty dismal. In a sense though, projection is all we can do. Cognitive psychology points out that you can only think of things that are like something you have already seen or experienced. For example, the unicorn. It’s a horse…but it has a horn like a narwhal. Got it? This is also why aliens and gods always look like human beings, or why we can find a face in just about any work of abstract art. Everything starts with projection. How does it break through into the imagination? Let’s look at two literary examples of projection. Gustave Flaubert famously said about one of his main characters, “Madame Bovary, c’est moi.” (“Madame Bovary, that’s me,” or, “I am Madame Bovary.”) He meant Emma Bovary’s ennui, her struggles with mundaneg married life and suburban existence—these things mirrored his existential dilemma. The accomplishment of his novel Madame Bovary then, is how different the author and his main character are in terms of everything else: they are different sexes, different classes, hold different jobs, live in different parts of the country, speak different dialects and are awake for different hours of the day. They are the same, yet his projection has covered a lot of ground. I’m not saying that this is necessarily better than having a protagonist who shares several key characteristics with the author: maybe they work the same job, live in the same type of residence, hold the same place within the family system, have the same build, and even have names closely related to each other. All of these things are true in Kafka’s “The Metamorphosis,” which is no less a work of fiction that Madame Bovary. Granted, in “The Metamorphosis,” the main character has been transformed into a giant cockroach—an important difference by which Kafka’s inner world is symbolized, and by which that world springs to life and is dramatized in a wholly original manner. This breakthrough into the world of the imagination cannot be achieved if you are suffering from the curse of the converted memoir. In The Book Architecture Method, we address the work that we have created at the mid-point of revision; we have climbed to the top of a mountain in our Scene and Series work, and are ready not only to encounter the Theme we think we have been working with, but also the Theme that we have truly encoded in the work. And then we are free. Just like in life, when we discover we are in charge of creating our own reality, the feeling that writers report when they accept the above set of facts is: delight. Now the fun starts, finding the boundaries: how are characters identified? What sides of their personality come out around different types of people? How do they think, and how do they think they think – we don’t have to take anything at face value anymore. Wherever there is a boundary, we can blur it.